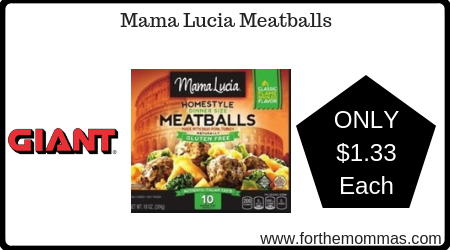 Giant: Mama Lucia Meatballs JUST $1.33 Each Starting 12/7! No coupons needed for this deal. Starting from 12/7, Giant will have Mama Lucia Meatballs 10 oz priced at $3.99 each, and you can get TWO Free when you buy one, making your final price ONLY $1.33 each!